OK. This post has nothing to do with holiday decor, recycling, or repurposing. But it is one of those ‘palm-of-hand-knocking-against temple’ kinds of clever household tips. So at the risk that every other person in the world has already figured this out, I’ll share it anyway in the hopes of reaching just one person who has shared my plight against clothes that slip off hangers. One word. Rubberband. 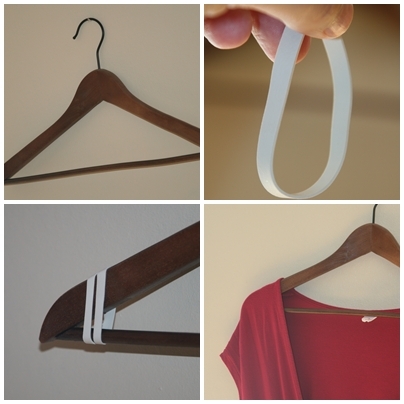 Yes, it took me 44 years to realize that wrapping a simple rubberband around the edges of the hanger would help to hold wide-shouldered clothing on a standard hanger. Okay, maybe I didn’t care the first 20 years of my life when my clothes ended up in a pile on the closet floor, but after a while it bothered me. I had my lightbulb moment in a thrift store (bless thrift stores everywhere!) who were preventing sliding clothes with rubberbands. No need to buy fancy fabric hangers. Okay, maybe just a few very cool handmade hangers from indie creatives. 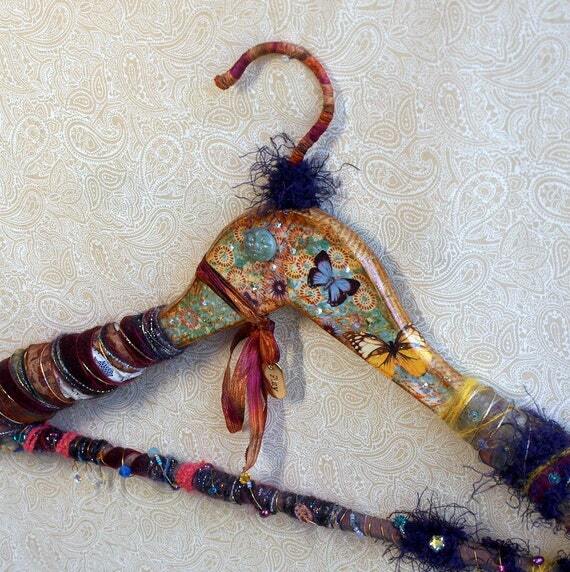 And while I would LOVE to have a closet full of artsy hangers, it won’t be happening anytime soon given the price. This artist may not actually intend for them to be used in the closet, but I like ‘living’ with art – so I would definitely try to incorporate them into daily living. I’m sure my growing collection of clever household tips on Pinterest won’t be challenging Hints from Heloise anytime soon, but if you want to have a few ‘aha’ moments, hop on over to have a look. Ok – I've never heard of this rubber band trick! Thanks for this – I shall be fixing up my hangers today! Off to check out more of your tips on Pinterest! Thank you for sharing this tip! It has always upset me how the wide cut tops fall down from my hangers when I move them around. I am very curious about how the rubber bands will work when i have quite many of those tricky tops hung in the same row. And you do have an impressive collection of great pins on Pinterest! I started following quite some boards as they fit perfectly my interests. Thank you for creating these collections!